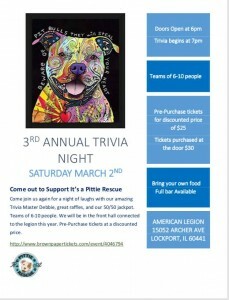 Come out to the support It’s A Pittie Rescue at our 3rd Annual Trivia Night fundraiser! Join us again for a night of laughs with our amazing Trivia Master Debbie, great raffles, and our 50/50 jackpot. Teams of 6-10 people. We will be in the front hall connected to the legion this year. Tickets purchased at the door $30.